After just a few short weeks of doing this blog thing, I’m realizing how common, natural, and cliche it is to start a story with “I love…” It’s just that, this is what it’s about! Stuff I love! I adore cheesecake. I crush on, cherish, am captivated by, and think the world of it. I know, I know, it’s a little unhealthy to be so wild for a dessert. Lest I go overboard, I do make it rarely… and sometimes, I like to make it mini. Just a few little bites of bliss. I came up with this version after I picked up a few boxes of Anna’s Ginger Thins – have you ever had these? If not, get thee to a cookie aisle stat! They’re yummy crisp gingery thins in cute little flower shapes – low calorie, no trans fats, gotta love them. Er, admire them. Anyway, I thought they’d make an excellent crumb-based cheesecake crust… and with pumpkin cheesecake (adapted from Paula Deen’s pumpkin cheesecake recipe), all the better for this time of year. 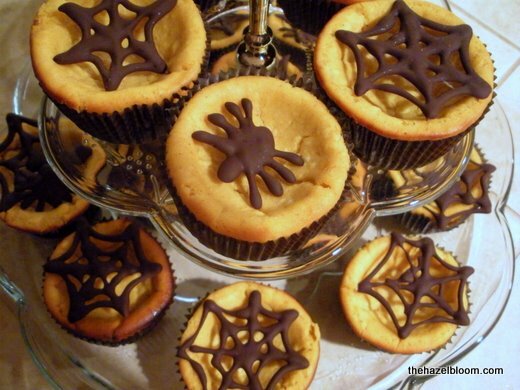 Topped with a little dark chocolate, they were perfect for our little Halloween shindig. Or anytime. Turn the oven to 350. Place cupcake liners into 18 (regular sized) muffin cups, and lightly spray with Pam. Place the ginger thins into a Ziploc bag, and crush with a glass or rolling pin. In a bowl, mix the ginger thin crumbs with the melted butter. Place a heaping tablespoon full of the crumb mixture into each muffin cup. Press the crumbs firmly into the lined muffin cups. A small juice glass or shot glass might work, or you can just press with your fingers. Use a hand or stand mixer to beat cream cheese until it's smooth and starts to get a little fluffier. Add eggs, sugar, pumpkin, sour cream, and spices. Then add the flour and vanilla. Mix until well combined. Pour about 1/3 cup batter into each muffin cup. Bake for 25 minutes, until cheesecakes are JUST past the point of being loose/jiggly in the center. Remove from oven and let cool for 15-20 minutes. Cover with plastic wrap and transfer to refrigerator to chill for at least 2 hours. Chop up the chocolate, and place in a microwave-safe bowl with 1/2 teaspoon vegetable shortening. Microwave on high for 30 seconds, remove, and stir. Continue to microwave in 15 second intervals, removing and stirring, until the chocolate is just melted. Spoon the chocolate into a Ziploc bag (or pastry bag). Snip the end of the Ziploc bag JUST BARELY. You just want a tiny hole. Now draw with chocolate! Squirt the chocolate onto the parchment-paper-lined cookie sheet. Make any little shape you want to top your cheesecakes with. 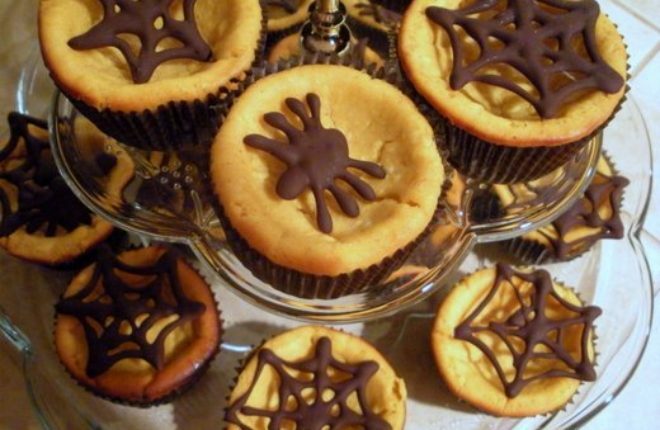 I was making these for our Halloween party, so I opted for spider webs and spiders. Set your chocolate art aside to harden. If you do this at room temperature, it may take an hour or more. Or you can refrigerate to accelerate the process. Remove the cheesecakes from the muffin tin. 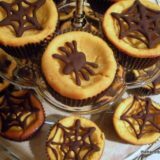 It may help to use a butter knife on the outside of the cupcake liner to gently pry it out. 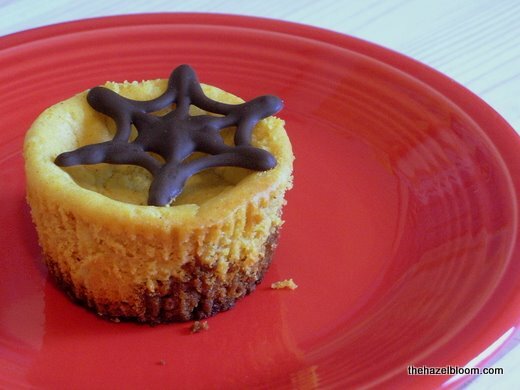 Carefully remove the chocolate shapes from the parchment paper, and arrange on top of the cheesecakes.